Join the discussion on our forums! Come discuss Giant Sand Worm over in our dedicated Giant Sand Worm discussion topic. IF you're going second you can use Tundra Rhino + Giant Sand Worm + Bestial Wrath after Thaurissan discount for 11 mana. Not good enough for competitive play but it sure satisfies the memes! How often do you see Gruul played? Never. Same thing. If only this was released on a slower meta, it might have seen a lot of play with cards that make beasts immune. Also, has anyone managed to NOT get the effect to proc? They might aswell change "may" to "will" at this point. Today, on WHAT WOULD THEIR CHILDREN LOOK LIKE? A more aggressive Ironbark Protector for hunters. Don't see much play in constructed because Call of the Wild is more OP for an 8-drop but it's actually a solid card by itself. This deserves to be a Legendary more than The Boogeymonster does, that's for sure. Should have had 4 attack and charge. Oh boy when this comes out of Ram Wrangler against zoo at turn 5 and is not answered. Full board clear and at least 8 damage to the face (10 when followed by Houndmaster at turn 6). Had this situation a moment before and it was just hilarious! Now hunter has a board control card, not great but playable. 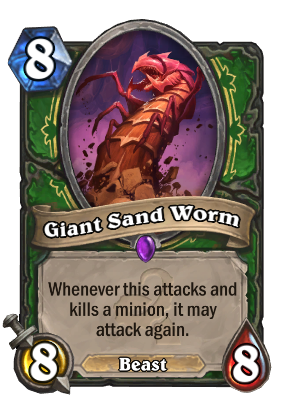 Giant Sand Worm better then all of them. Maybe Unleash be better but so many time you're using unleash for pushing lethal. Haven't seen anyone who playing explosive shot, powershot and Multi shot. Dreadscale is only good against token decks. So many players playing around explosive trap. This minion wants a hard removal.